Pretty On The Outside: Ricky Martin gets a star. Crowd gets excited. 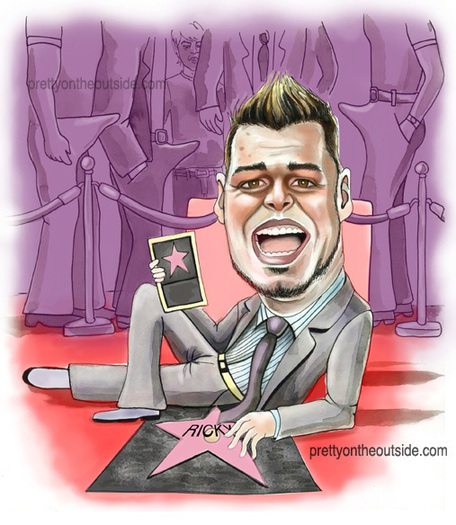 Ricky Martin gets a star. Crowd gets excited. Ricky Martin was quite excited to be getting a star on Hollywood Blvd. I'm sure some in the crowd were excited as well. I'm sure some were very, very excited. For more Ricky excitement inducing photos check here and here and here. Ink and graphite on paper with digital color. I dunno, that guy on the left there is showing a rather straight looking ridge on top--is that caused from plastic surgery? lol... okay, I didnt notice the boners until I stared at it for a minute.. you never fail to crack me up. I hate to say this, because Ricky is hot, but he almost looks a tiny bit like...Perez Hilton there.